WASHINGTON — The House approved a measure Friday that would put new constraints on executive pay, capitalizing on populist outrage over multimillion-dollar bonuses to Wall Street executives whose companies were bailed out by taxpayers. 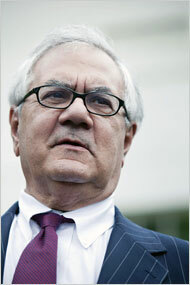 The bill, introduced by Representative Barney Frank, would also let shareholders make nonbinding votes on executive pay. The measure passed 237 to 185, with most lawmakers voting along party lines. The Senate will consider executive compensation as part of a regulatory overhaul package after its August recess. The bill, introduced by Representative Barney Frank, Democrat of Massachusetts, enables regulators to ban payments that give workers what the legislation calls “perverse incentives” to take risks that could hurt the nation’s financial system. The bill gives the Securities and Exchange Commission, among other federal regulators, nine months to propose rules for regulating compensation packages at institutions whose assets total more than $1 billion. “Empowering financial regulators to prohibit risky bonus practices by financial firms is not only long overdue, but the responsible thing to do for the taxpayers, who have ended up footing the bill for too many corporate excesses,“ Speaker Nancy Pelosi, Democrat of California, said in a statement. The legislation would also allow shareholders to vote on executive pay, though those votes would be nonbinding. In addition, it requires that individuals from outside a company’s management be included on compensation committees, and that these people receive no pay from and have no relationship to company management. The passage of the bill comes after news on Thursday that companies receiving bailout money had paid bonuses of more than $1 million each to thousands of their employees for 2008. The New York attorney general, Andrew M. Cuomo, reported that nine banks that received billions in taxpayer bailout money had awarded bonuses of more than $1 million apiece to 4,800 employees. Even at weaker banks like Citigroup, which has not returned any of the $45 billion it received in bailout money, 738 employees received bonuses of at least $1 million, out of a total bonus pool of $5.3 billion. “What we’ve seen on Wall Street in the last many years is turning that concept of pay for performance on its head,“ said Representative Chris Van Hollen, Democrat of Maryland. In the House floor debate, Democrats, who blame excessive bonuses for contributing to the financial crisis, played up the importance of shareholder input on executive pay. “We must have a very strong, definitive say-so from the shareholders,“ said Representative David Scott, Democrat of Georgia. Republicans slammed the measure as yet another example of needless government intervention into private business practices, similar to arguments that they have been making in the debate over health care. The bill would “take away the rights of individual companies to conduct business as they see fit,“ said Michael Castle, Republican of Delaware. Though the Obama administration has advocated that shareholders have a nonbinding vote on executive compensation, and encouraged the elimination of conflicts of interest on compensation committees, the White House has not suggested that federal regulators curb incentive-based pay for risk-taking. The bill is only a part of the president’s overall push for changes to financial regulation. Mr. Obama has also proposed giving the Federal Reserve greater authority to monitor financial institutions and establishing a consumer financial protection agency, though members of both parties have expressed unease about the extent of the agency’s powers. Democrats acknowledged that the bill, by itself, would not prevent another financial crisis. “This just scratches the surface,” said Brad Miller, Democrat of North Carolina. The legislation comes as the Obama administration is separately examining the pay practices of seven big companies that have received significant taxpayer assistance in recent months. The administration’s top official for compensation, Kenneth R. Feinberg, has been talking with the companies as he considers whether to approve the compensation of top executives at the American International Group, Citigroup, Bank of America, General Motors, Chrysler and the financing arms of those two automakers. A version of this article appeared in print on August 1, 2009, on page B1 of the New York edition.